Parkside Flexibles has invested in two X6 slitter rewinder machines from Universal Converting Equipment to boost its operations in the UK and Malaysia. The flexographic printer will utilize the newly installed Universal X6 slitting machines to ensure product consistency and minimize changeover times. Parkside Flexibles global technical manager Brian Harper said: “From day one, the machines have been producing product of a quality we could not achieve consistently on our other slitting machines. The X6 slitter machine features a closed loop rewind tension control with load cells designed to provide feedback while ensuring that the winding tension is exactly as required. Additionally, the machine is integrated with X-Slit slitting system which uses automatic positioning to control the position of knives and anvils to very tight tolerances. The machine also features a “Quad” wrap material drive system to isolate tension between the unwind and rewind as well as the constant geometry contact rollers which move horizontally as the rewind roll increases in size. Universal Converting Equipment managing director Alan Jones said:”The X-slit slitting system provides a lot of flexibility as well as fast and accurate set up. Universal Converting said that the X6 slitter rewinder also features a print repeat measurement system designed to measure the length of each print repeat and then generate a report and graph showing the variability through the roll. 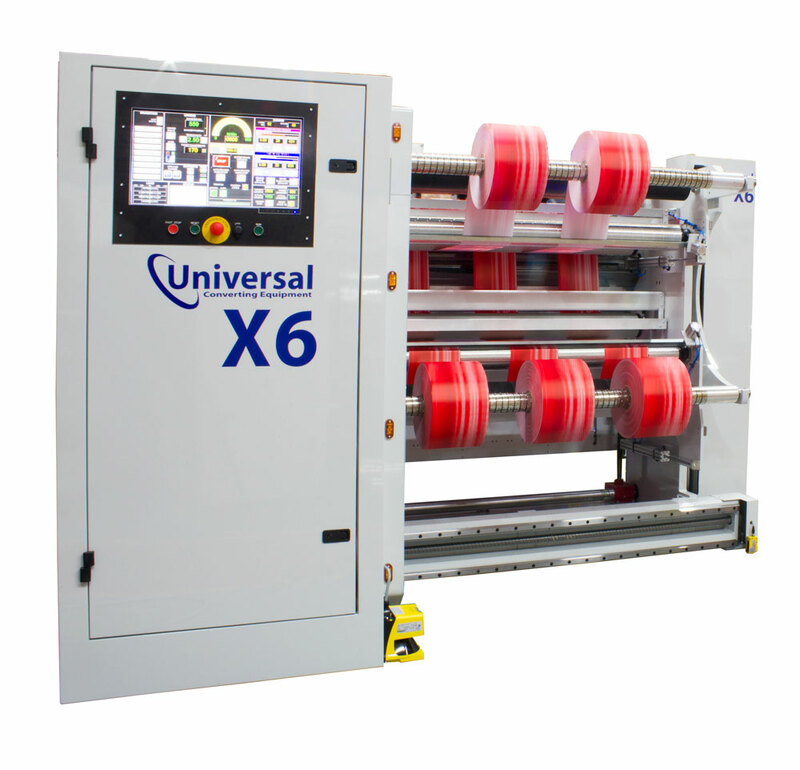 Image: A Universal X6 slitter rewinder machine. Photo: courtesy of Universal Converting Equipment.